We are a leading Manufacturer of examination gloves for medical colleges from Chennai, India. We are one of the leading manufacturers and suppliers of Examination Gloves for Medical Colleges. 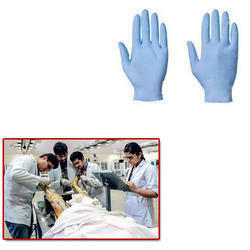 The offered examination gloves for medical colleges are very commonly worn by the medical students and doctors. Our supplied examination gloves for medical colleges are used during the examination of ailing people and patients. Looking for Examination Gloves for Medical Colleges ?